Cory and Carrie from Midwest Gluten Free sent this my way after giving my Tequila Fresca idea a shot. Say, there’s a reason you get top billing in the name of this blog. I think you’re great. What you’re wearing today makes you look really good, too. What you wore last Wednesday wasn’t so hot, but the fact that I can tell you these things just shows what great friends we’ve become. So, great friend, I want to get to know you better. You’ve been in my kitchen. What’s happening in yours? Have you made that Thai-Inspired Butternut Squash Soup yet? Or Tequila Fresca? Or nacho? If you have, I want to hear about it. And I’d love to see it, too. I was overjoyed to receive this photo from Cory and Carrie, who run Midwest Gluten Free, a great resource for anyone with celiac disease or gluten intolerance. Cory and Carrie started the site after learning their daughter has celiac disease. 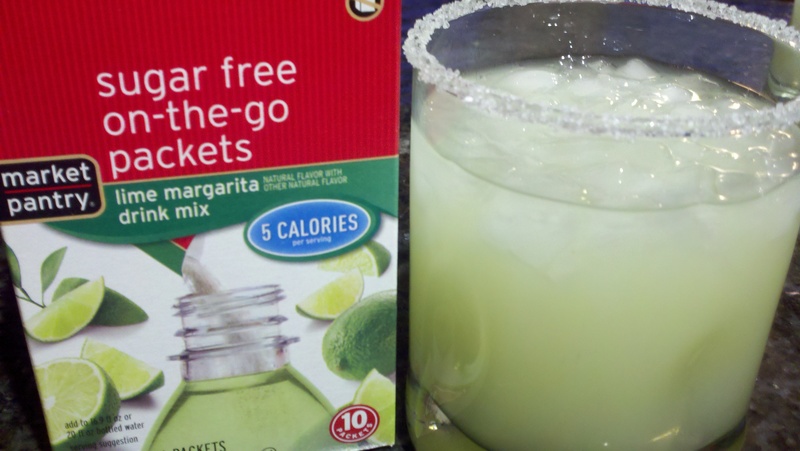 Cory and Carrie gave my Tequila Fresca idea a shot, and then discovered something they said was even closer to the taste of an actual margarita. They subbed Peach Fresca with some sugar-free packets of lime margarita drink mix from Target, and were very pleased with the results. So here’s where you come in: What’s your favorite cheap, easy-to-make drink? Share a photo or recipe on the brand new You’re In My Kitchen Facebook Page, e-mail them to me at cavan@youreinmykitchen.com or leave your recipe below. No judgment here, people. You’ve seen me drink vodka from jugs through straws. If Cory and Carrie have already discovered a new take on Tequila Fresca, imagine what we can all do if we work together. That’s right — we are going to save the world. And we’ll need some cocktail ideas before we take that on. This entry was posted in Cocktails, Pleasantries by Cavan Reagan Reichmann. Bookmark the permalink.